A privatisation-mad Tory MP today demanded that profitable parts of the publicly owned RBS bank must be flogged at all costs. 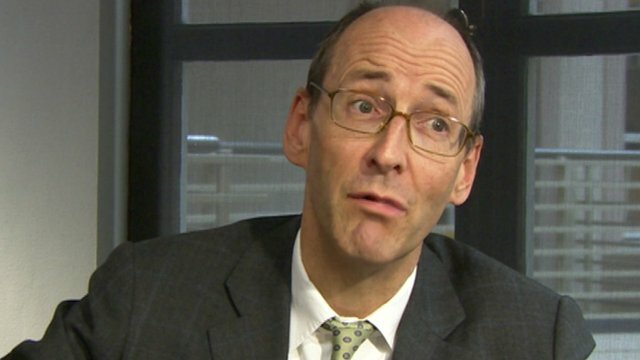 Andrew Tyrie (pictured), who chairs Parliament's commission on banking standards, wants to let privateers cherry-pick parts of the bank and make the taxpayer shoulder bad debts. Splitting RBS into good and bad banks was just one option given in a recent report by the cross-party commission. But even austerity-obsessed Chancellor George Osborne is believed to be unenthusiastic about the prospect. Mr Tyrie has now urged the Chancellor to examine the "future structure" of RBS as "a matter of urgency." In a letter to the Financial Times laced with bankers' jargon, he argued: "Formal accounting conventions should not be allowed to get in the way of what is best for the economy." Left Economics Advisory Panel co-ordinator Andrew Fisher said the misplaced debate centred on "what is the best way to privatise RBS." "Osborne worries that the public bad bank would worsen his deficit figures and that the toxic debts aren't too bad anyway." But Mr Fisher said: "Labour should be calling for a publicly owned bank that can invest in new infrastructure to create jobs, reduce unemployment and operate in the public interest - something neither side of the Osborne-Tyrie pantomime cares about." The unemployment figures, as they are popularly known (or Labour Market Statistics as they are officially known), reveal some insights into the state of the 'UK recovery'. Unemployment has bumped around 2.5 million now for four years. At 2.514 million, UK unemployment is at an almost identical level to two years ago - and 2,000 higher than in the first quarter of 2010, just before the 2010 election which brought the Coalition to power. The small drop of 4,000 unemployed means at this rate it would take over 16 years for the Bank of England's target of 7% unemployment to be reached. Furthermore, a new record was reached for the number of people working part-time who want full-time work - with 1.433 million looking for more hours. Overall, unemployment on the wider US-style U6 measure stands at over 6.8 million people (with only half a million vacancies in the economy). 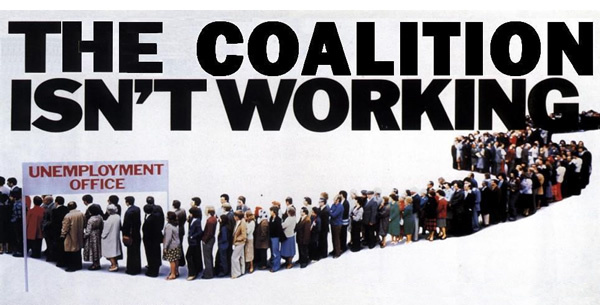 The controversial Work Programme - the coalition's flagship privatised back to work schemes - are failing badly. Despite the tens of millions of pounds channelled to private providers such as A4e, long-term unemployment continues to grow - now reaching its highest level for over 17 years: 909, 250. Likewise the £1 billion Youth Contract scheme seems to be having little effect (other than lining the pockets of unscrupulous employers), as youth unemployment is today 45,000 higher than when the Coalition came to power - and rose 15,000 in the last 3 months. Youth unemployment now stands at 978,000. Worse still, the government figures include 164,000 people as 'employed' on government supported training and employment programmes - many of which are the failing workfare schemes. The numbers on the schemes rose 17,000 in the last 3 months. As pointed out last month (Is the UK economy on the up? ), the current recovery is particularly precarious as the recovery seems to be supported by a falling savings ratio and escalating personal debt. And the ONS stats today again highlight the enduring squeeze on wages, with regular pay rising just 1.1% in the last year. This comes in the same week that we learned inflation is at 3.1%, rail fares will rise by 4.1% in January 2014, and that food price inflation currently stands at 4.4%. Any sustained recovery needs to be accompanied by a sustained recovery in household incomes, but that seems as far away as ever. Bosses of bailed-out Lloyds bank revealed today they will hand a massive 70 per cent of profits to shareholders in a bid to speed up privatisation plans. Chief executive Antonio Horta-Osorio issued the invitation to asset-strip the part-publicly owned bank because private investors have so far only shown modest interest. The government owns 40 per cent of Lloyds, acquired when it saved the bank from collapse in 2008 with £17 billion of public money. Ministers are desperate to flog the stake - and so cut the public out of dividend payments - because of their privatisation obsession and have offered Mr Horta-Osorio a £2 million bonus to deliver the sale. His plans to give away a staggering 70 per cent of profits by 2016 would mean that Lloyds pays higher dividends to shareholders than any other bank. Leading left-wing economist Andrew Fisher said it was a "slap in the face for the British public, who bailed out banks like Lloyds. "It makes it clear that what many of us have said all along is true - we nationalised the debts, while the profits are privatised," said the Left Economics Advisory Panel co-ordinator. "Lloyds's grotesque dividend and executive pay bonanza comes at the expense of its customers, the taxpayer and its own staff - at a time when over 3,000 job cuts have been announced." Austerity-Addicted Chancellor George Osborne has left nine million more people in financial difficulty compared with seven years ago, Money Advice Service revealed today. The independent body found that 26 million people across Britain are now living on the brink of financial ruin - a massive 35 per cent rise since their last survey in 2006. Failing Tory economic policies have sent hourly income plumetting by 6 per cent and sparked a "live for now" attitude to cash among the population. For example, more than one in five of the 5,000 people surveyed would rather have £200 immediately than £400 in four months' times. A Treasury spokesman claimed the government had helped households meet the rising cost of living by raising the personal tax allowance and freezing fuel duty. He said: "We recognise that times are still tough for families, but Britain is holding its nerve, we are sticking to our plan and the British economy is on the mend." But Labour shadow Treasury minister Catherine McKinnell said the figures bust George Osborne's "out of touch claims that people are better off." She said: "This government's failed economic policies mean prices are rising much faster than wages. And their unfair choices have seen hard-working people hit hard while millionaires get a huge tax cut." Ms McKinnell said Labour would help families "with a lower 10p starting rate of tax, paid for by a mansion tax, and take action to tackle soaring rail fares and energy prices." TUC general secretary Frances O'Grady added that only "strong growth underpinned by decent jobs and higher pay" would end the "longest real wage squeeze since Victorian Times." Separate figures showed there had been a 3 per cent rise in the number of people being force to declare themselves bankrupt over the last three months. And the Left Economic Advisory Panel's Andrew Fisher warned: "As personal debt starts rising again it is clear that the squeeze on living standards also creates a huge economic risk if loan and mortgage defaults rise, threatening the banking sector again." Isn’t it interesting how governments go through the rituals of promoting competition, but little actually changes? The latest example is the UK Competition Commission’s report on the UK auditing industry. The report is supposedly concerned with enhancing competition in the UK auditing market. The current position is dire. Thanks to the close alignment between corporate interests, policymakers and politicians, successive governments permitted restrained mergers. Today the auditing market is dominated by just four accounting firms. These are PricewaterhouseCoopers, Ernst & Young, Deloitte & Touche and KPMG (known as the Big Four firms), and between them they audit 99 of the UK’s biggest listed companies (FTSE100) and around 240 of the next 250. On average, a FTSE100 auditor remains in office for about 48 years; for the FTSE250 the average is 36 years. The Big Four firms are dominant in most western countries. Their global income from auditing and consultancy services is about £77 billion (US$115 billion) and some £7.9 billion ($11.9bn) of it comes from the UK. This provides plenty of financial and political resources to thwart any unwelcome policies. The probability of another accounting firm breaking into this magic circle is extremely low as the entry costs are high. The challengers need help but there is little on the table from the Competition Commission. The Commission does not want to break-up the Big Four firms or place any limits on the proportion of market they can dominate. It does not want to place any time limits on the audit firm’s tenure either. This monopoly of company audits has been the springboard for the growth of the Big Four accounting firms. Audits give accounting firms easy access to company boards and lets the accountants sell all kind of additional services, ranging from tax avoidance, advice on mergers and takeovers to printing T-shirts, badges and laying golf courses. All this increases fee dependency on clients and must lessen the probability of speaking out against unsavoury practices. At the dawn of the banking crash, concerned savers were forming queues outside distressed banks and governments were bailing out banks, but auditors gave their customary clean bill of health to all distressed banks. This silence was not followed by any investigation by the UK government. There is no action by any regulator either. Even if they act, it takes years. The matters relating to the audit of automaker MG Rover by Deloitte were referred to the Financial Reporting Council, the UK regulator, in 2005. It finally reported on 29 July 2013. The regulatory inertia neither encourages competition nor improves the quality of audits. Last year, a tax tribunal heard a case relating to a tax avoidance scheme designed by Ernst & Young for Iliffe News and Media. The company was very profitable, but was concerned that healthy profits would encourage employees to demand higher wages. So Ernst & Young, who were also the company’s auditors, designed a scheme that would artificially depress profits and avoid tax too. The company’s board minutes stated that Ernst & Young confirmed that the use of the scheme would also “significantly lessen the transparency of reported results”. Despite such episodes, the Competition Commission does not want to ban the sale of consultancy by auditors to their audit clients. The best that it can come-up with is that companies might put audits out of tender every five years. The Competition Commission could have increased the market pressures on auditors to improve quality of audits by empowering consumers of audit opinions, but it does not do that. Auditors only owe a “duty of care” to the company rather than to any individual shareholder, creditor or any other stakeholder. So individuals can do little to bring negligent auditors to book. Court cases such as MAN Nutzfahrzeuge AG & Anor v Freightliner Ltd & Anor  show that there is little recourse against auditors even when they are found to be negligent. At annual general meetings (AGMs) shareholders are asked to vote on auditor appointment and remuneration, but this resolution is not supported by any information about quality of audit work, lawsuits or regulatory action against auditors. Shareholders are not given any sight of auditor working papers. Shareholders have no idea of the work done by auditors. Auditing firms are commercial concerns and their success is measured by profits. In pursuit of profits, the firms reduce the time allocated to each audit even though audits are labour intensive and need a higher time budget. The hope is that aspiring accountants will work evenings and week-ends for free. Academic research shows that a large number of audit staff do not go along with such strategies and resort to falsification of audit work or ignore awkward transactions because they require more time than is allocated. Audit failures are manufactured by the business model and organisation culture of accountancy firms, but this does not even appear on the radar of the Competition Commission. There is little meaningful public information about auditors. There is no public availability of audit contract, information composition of the audit team, time spent on the job, details of meetings with company directors, or anything else that might enable the consumers of audit opinions to assess audit quality. The Competition Commission has capitulated to the lobbying power of the Big Four and failed to introduce any meaningful reforms. Maybe such issues will be considered after the next banking crash.